Have Questions? Email us - we'd be happy to help! 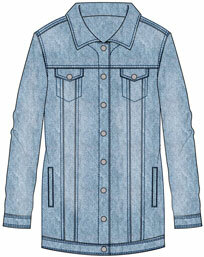 Maxi Jean Jacket: Is there even such a thing as too much denim? We didn’t think so, which is why we gave this jean jacket a little extra length – more to love. This piece is a sophisticated remix of a casual garment, with the added bonus of pockets on the side. With a hem that hits at the thigh, this versatile light-wash piece looks great paired with a knee-length skirt, skinny neutral pant, or cropped dark jean for a stylish double-denim vibe! *All photos are property of Tribal Inc. I like this jacket for the length. Also very nice stretch. Color is good and material good quality. The only reason I gave it 4 stars is because I had to order up a size so that it would snap properly across the chest area and now shoulder area a little bit too large. I’ll only be able to wear this with sweaters now.